The Model 7550 provides four main compartments totalling 550 bushels (19,400 litres) and the KNEX full inter-tank flexibility system that Bourgault air seeders are renowned for. 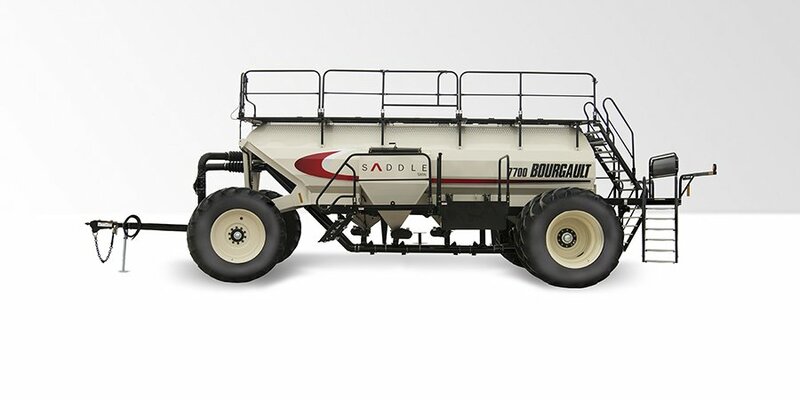 The optional 20 Bu Saddle Tank mounted on the left side is designed for the seeding and storage of bagged product and raises the total tank capacity to 570 bushels (20,090 litres). Standard, large 900/60R32 tires (rear singles) requires 24 psi (165 kPa) inflation pressure, even when operating fully loaded. Optional 650/75R34 rear duals with a lower 16 psi (110 kPa) pressure requirement are available. Compaction is minimal allowing farmers to continue to fill the compartments even in wetter seeding conditions. The Model 7550 is equipped with the 10" Deluxe Load/Unload Auger that will greatly reduce your fill times. Depending on your priority, 7000 Series air seeders have two different seed application controllers. For those Operators wanting extreme capability, Bourgault offers the ISO/X30 Apollo System*. The X30 Apollo System provides unprecedented control of the 7550. Alternatively, Bourgault offers the ISO Apollo System which provides basic control for those individuals who wish to use the Virtual Terminal in thier tractor. The Model 7550 comes standard with a stand-alone camera system and a 7” (18 cm) LCD screen. Each tank compartment is equipped with a separate camera to monitor product levels and a rear view camera allows you to watch for approaching vehicles when transporting from field to field. The PDM Pro, the heart of Bourgault's industry leading air seeders is standard on the 7550 Air Seeder.